Alternanthera is a large genus of usually low-growing annuals and perennials. Mostly evergreen most species of Alternanthera are grown for their attractive foliage. These lovely plants are ideal for growing along garden borders, as ground covers or in formal bedding. 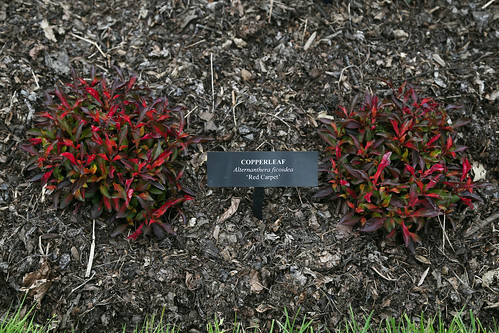 Most species of Alternanthera do not require special care. A balanced soil, moderate watering and a sunny spot will keep them healthy. Some species of Alternanthera can be invasive and should be trimmed regularly to keep them in shape. Alternanthera ficoidea, commonly known as ‘Red Carpet’, is a better known species from the genus of Alternanthera. Known for its colorful foliage, Alternanthera ficoidea is a low-maintenance plant that makes a good choice for both indoor (ornamental houseplant) and outdoor (ground cover) usage. It is grown from both seeds and cuttings and requires moderate watering in summer and protection from frost and overwatering in winter. Alternanthera ficoidea is a fast growing plant and can be used to fill garden borders or empty spaces in landscapes and rock gardens. It grows from 6 to 12 inches in height and form mounds of attractive foliage.